• The year was 1982. 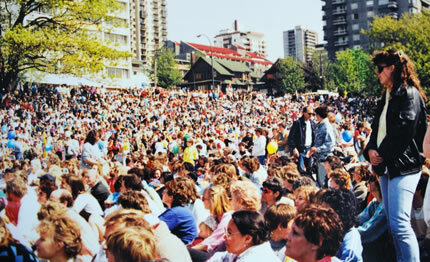 Against the backdrop of the escalating nuclear arms race, 168 different groups cooperated to create Vancouver’s first Walk For Peace; 35,000 people gathered that first year, followed by 65,000 in 1983 and by 1984 we were 100,000 strong. We came together at Kitsilano Beach and formed a river of people that poured over Burrard Bridge to a concert stage at Sunset Beach. It was magnificent. This is 2012 and the times are different. Politicians, technology and the global landscape have all changed. People feel a different kind of angst and there is an urge to connect in person to feel our shared spirit for peace. Thirty-years-ago, before cell phones, personal computers and the internet, people started talking and meeting to co-create their vision of a more peaceful world, beginning with where they lived, in their own communities. My family lived in Kitsilano, across from Kits Beach in an old house, which is no longer there. When I volunteered to coordinate that first year in 1982 my first child was just two years old and I was 32 earning my livelihood doing carpentry renovations. I called up friends and invited them to gather with their friends at our place for a meeting to organize a peace walk. I knew people liked to walk in Vancouver. Many had walked on behalf of whales, the environment and myriad important causes so I figured they would walk for peace. One day, my friend Rick Testa and I brainstormed a new name for such an event and the simple term Walk for Peace was born. Each meeting progressively grew in numbers and by the second gathering my living room had become too small. We were prompted to move to the SPEC building at 6th and Maple, which we also outgrew so we began to host our meetings in larger church spaces and union halls. What had started as an inspiration flourished and grew into the largest peace events in Canada’s history… and it was happening right in our own backyards. The initial vision had been embraced by people of all religions, cultures and races. We were truly finding common ground for peace. Soon, our networking efforts grew into168 different groups and organizations, all united by a desire for peace in our world. There were educators, environmentalists, labour organizations, lawyers, engineers, feminists, religious groups, students, grandparents, war veterans, politicians, mayors, mothers, fathers, musicians, actors, bird watchers, gardeners … the bandwidth for peace just opened up. The success of our first Walk for Peace in Vancouver was a total surprise and inspired cities from Victoria to Toronto and Halifax to host their own Walks for Peace in subsequent years. Initial organizational meetings for the 30th anniversary Walk for Peace have been held from noon to 2 PM Saturdays at the Centre for Peace on West 16th at Burrard. (The #33 bus stops there.). We are looking for additional meeting places, volunteers and sponsors related to this event. If you or your organization would like to endorse or help sponsor the 30th anniversary of the Walk for Peace, please contact Alastair Gregor or Joseph Roberts at 604-733-2215. Email live@commonground.ca. Thank you for supporting the Walk for Peace. I am revving up my new House of RAWK Raw Adventures on Gabriola Island, B.C. Thanks for doing what you do .. so well!! !